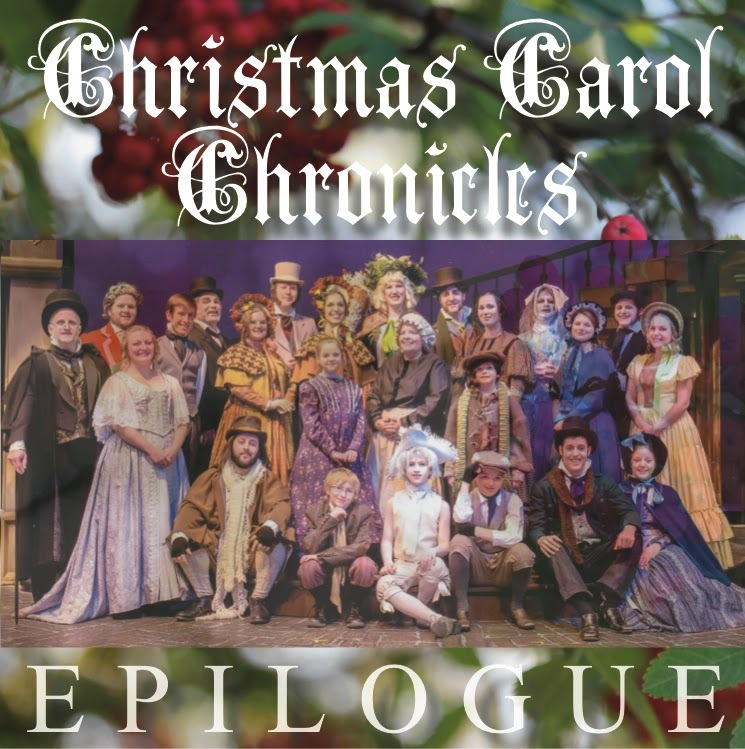 These are the thoughts and reflections of the cast, crew and artistic team of A Christmas Carol on the experience we shared together in October/November 2014. This show, my eighth show and second one with Keyano, has been a wonderful experience. I have been exposed to a new group of players and I personally am glad that I auditioned. The show has made me focus and realize how much potential the city has to offer when it comes to community theatre. This is also my second time playing a young Russell Thomas, and the second time has been a significant difference! Many memories have been made and friendships that have bonded that I will hold close to me as I move out to university to go into theatre! I am very grateful that I got the opportunity to be in this show and got to work with the wonderful Jacqueline Russell and to again work with the amazing Steph Link. Thank you to all of the cast and crew of Keyano for putting up with me over the past six weeks and god bless us, everyone! Up to this point of the journey of this production, the account was from Russell and his experiences thus far written in his blog. His blog of this journey was a daily read for me as I am an import from Saskatoon working on this show as the Lighting Designer and it was a chance for me to distract myself and fill up my days of missing home and being in a different place that pulled me out of my comfort zone. I hail from Saskatoon and when I was offered the opportunity to design and contribute to this classic story I took it without hesitation....well okay there was a little bit of hesitation! I took the job without knowing any details except for the script, I didn't know the director, the actors nor the theatre space. This leap I took was by far the scariest thing I have done as I have never worked away from home before this. Looking back now with what has happened and what I have learned and gained, I am very happy and grateful to all involved. To Trevor McDonald and all the admin staff for taking a risk on someone who they have never worked with before, I thank you! To the cast of this magnificent show, a great big thank you. You all showed me, a stranger to your community, what big hearts people in Fort McMurray really have. The days were long and stressful at times for all, especially myself when I saw my lights turn on for the first time with the actors on stage and they were at the right place to light the cast as how I envisioned. We pushed through many long days where majority of them were filled with a lot of standing around while I adjusted my light levels or positions. The actors remained calm and professional. While many lighting cues were changed, close to 150 of them, the crew and the amazing director, Jacqueline Russell, to who I owe many upon many thanks that words cannot simply justify. They kept working and stayed calm, so that together we could paint the exquisite world created by the most incredible set designer I have ever had the privilege of working with, Roger Schultz, with light. In the end, the production that you have seen and enjoyed is a fruit of our passion for theatre. We do it not for the money or fame, we do it for the sake of telling a story to the people in our lives, our friends, family and to people we have never met. This experience and all the memories of the quick two weeks that I was a Fort McMurrian...is that the correct term? Will always be in my memory and I look forward to coming back again to work with such amazing people to create great theatre! Looks my flight is now ready to board, so I say thank you again and I cannot wait to return! Till then, thank you for all of this and till we meet again! One of the greatest delights of A Christmas Carol was working with young cast members. My first production was limited to adults over the age of 18. So, I must admit at first I had some reservations. But as the production proceeded I began to admire the commitment and enthusiasm of our younger cast. Their contributions to the show both onstage and backstage were tremendous. Their work onstage was “professional” in most every way. Their willingness to try anything was especially inspiring to me, an older and more inhibited individual. But another more tangible addition was their contributions backstage. Their positive enthusiasm kept my energy up even when fatigue began to take its toll. I so enjoyed dancing at Fezziwig’s party with Emily and watching Ben’s wonderful effort playing the Ghost of Christmas Past. I would like to thank Reese, Alysa and especially Camryn for the support and friendship throughout the run. I would also like to thank Bryan and Richard for their unbridled positive energy. Lastly I would like to thank Jack and Natalie for their huge contributions backstage and keeping sanity in the chaos of scene transitions. And Colin I can hardly wait to see you in the next production. My positive experiences throughout the show have convinced me of how essential it is to include young cast members in Keyano productions. If we want to truly share the magic of theatre it must appeal to both audiences and actors of all ages. The only way to sell the merit of community theatre and to nurture it is to ensure that the next generation is completely involved in the process. Also young actors should not be only limited to “kid’s shows,” but to shows that can be appreciated by larger audiences. Looking back now, a day after our last show of A Christmas Carol I realize that a few transformations took place during the rehearsals and preparation for the show. The first is that as time went on, the entire cast became the family of characters that we portray in Charles Dickens timeless story. This was especially true of the group of us that played the Cratchit family. I'm truly going to miss my parents, my brother and my sisters. We started as strangers and ended as friends. This camaraderie grew out of spending amounts of time together, diligently running lines and fine-tuning our interactions. The second transformation that took place was that we learned better how to act and react. What I mean by this is that our ability to improvise grew immensely, so much so, that by the end of the run when mistakes were made during the show, people were rolling with the punches and keeping everything running smoothly. Finally, I think we all learned how to work together towards a common goal despite our different personalities and lifestyles. All in all, acting for my first time with the Keyano Theatre Company was a wonderful experience and I would encourage anyone with an interest in acting or even getting to know other people in your town to give it a shot. God blessed me with new friends and great memories which I will always cherish. A big thank you and "Merry Christmas" to my family, church and workplace for supporting me the whole way through. And a Merry Christmas to you, dear reader. Being cast in this production has impacted me more than I could have imagined. I've re-discovered my passion for the theatre, created life long memories, and made amazing friends. I am so thankful for each and every moment on and off stage with this amazing cast and crew. I will truly miss seeing everyone everyday on and off stage. As I am writing this in the early morning before our two final shows, I’m finding myself choking up ever so slightly over my cup of coffee. When I was offered the part of Belle, my initial reaction was that they must’ve phoned the wrong person, or perhaps I had forgotten to clean my ears and wasn’t hearing things correctly. Luckily, my ears were sufficiently q-tipped, and from the initial read-through I have been in awe of the entire crew and cast that has been part of this show, finding that the more I gave - be it energy, hugs or help – it was returned tenfold. I will always treasure this experience, from which I’ve made great friends and had the opportunity to connect with people I would otherwise never have met – much less had the privilege of working with, both on and off stage. I will be forever grateful to have worked with such a professional group of people in a nurturing and challenging environment and – of course – in front of such a great audience. To you all, a very merry Christmas (or “God Jul”, as we say in Swedish) and thank you! As I sit and think about the craziness of the last six weeks of rehearsals and eight shows, it has made me realize why I love doing community theatre, it is the fact that it is made up of such a diverse group of people coming together to work hard to get to one goal, the goal of putting on a fantastic show. This is my umpteenth show I've done, my eighth Canadian show, my third on the Keyano Mainstage, and first as a Canadian. It is crazy to think that we were in the rehearsal hall six weeks ago reading the script as a full cast, some of us not knowing who anyone was at all and some of us knowing others from past shows we did on the main stage at Keyano Theatre. And before that we went through the terrifying thought of not getting into the show. My journey of this amazing adventure started on the 9th of August when I auditioned for A Christmas Carol where I envisioned myself playing the role of Scrooge's nephew Fred. When i got an email back from Jacqueline for callbacks for Fred and Young Scrooge I felt like I had a chance of getting in. I did the callback and thought I was going to get the role of Fred because I envisioned myself as him, but I also I felt I could play the role young Scrooge as well, as I never thought I could see myself as him, those callbacks were a little nerve-wracking to see these other gentlemen go ahead or behind me going through the same scene going through my mind was "will I get in at all" but I didn't let it phase me at all. Days go by and I hear at times people getting in and I kept wondering if I will ever hear back about if I got in or not. I found out nineteen days later by phone as our Stage Manager Steph Link called me asking if I would accept the role of Ghost of Christmas Future. I immediately took the offer as I wanted in big time. At first the thought of just playing a non-speaking role hit me when I told my parents that I got in, they instantly replied back "will you speak at all?" And I told them that I would also probably be doing ensemble pieces throughout. I started to think that it was almost a little racist and started saying "suppress the English" and other silly things like that. I remember talking to Russell about it and he told me in reassurance that "Actions can be louder than words". and that "It will be a great experience". There was also a lot of people who came out for roles. "Stay positive and it'll be a helluva ride," he said. So I took his advice and looked forward to the journey ahead. A little while later I was notified that Steph and Jacqueline talked together and they asked me whether I wanted to play Scrooge as a young man. I instantly agreed to play the role, I was ecstatic about the opportunity of playing Scrooge and I am happy about taking on the role. The month or so we had rehearsing for the show flew by as we ran through blocking, scene changes and the experience of finding who the character or characters we were playing were. For some, it was an uphill struggle, for others, a gentle stroll. For me, it was a little bit of both, as Scrooge and the Ghost of Christmas Future were on opposite ends of complexity. Scrooge, this multi-layered character going from being a cheery chap whose outlook on life was sparkling bright to going to dimmer and more self focused trying to make a living for himself and losing his fiancée, the Ghost of Christmas Future being this spirit whose goal is to help Scrooge change his ways. Both had their challenges, from remembering lines for Scrooge to remembering blocking for the Ghost of Christmas Future. I felt that the Ghost was the hardest to play though easy to find who it was. I found the hardest thing was the daunting task of the movement of the Ghost as all it did was point, so easily no lines to remember. But just like talking, pointing was as hard. I had nothing to give in the way of lines, I just had to sit there and listen as Russell became my cue book so to speak, giving me the lines to tell him where to look, point and just in all, experience and be involved with what's happening. 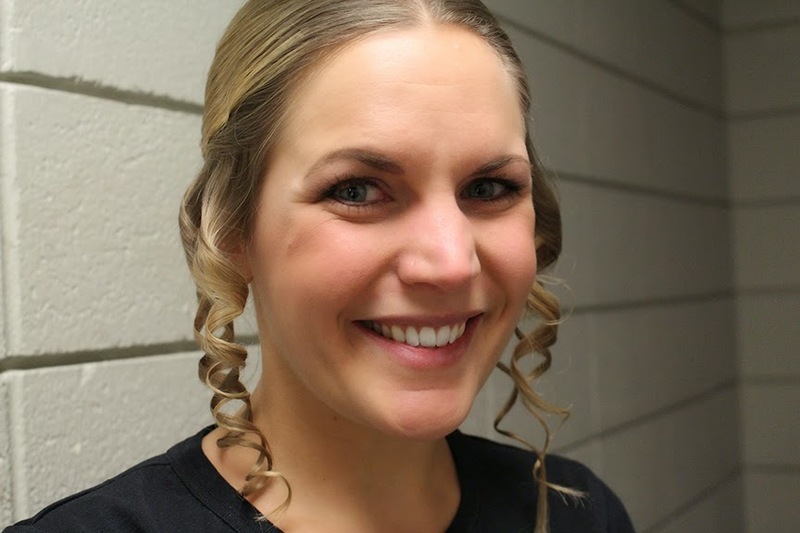 The most fun thing I found during the rehearsal stage was the few days I had to do the scene work between Scrooge as a young man and Belle played by Hanna Fridhed. Between the two of us we found this wonderful connection between Scrooge and Belle, one of love and hope which unfortunately is destroyed by the greed which envelops Scrooge into the world of money lending, the trade he lends his whole life to. In this time, Hanna and I got closer together and we learned more about each other and saw how many things we had in common. We fit so amazingly well together, that we took that and used to mold the interaction between Scrooge and Belle, to make them who they were and the passion they had for each other. Those one on one times with both Hanna and Jacqueline were special as it was a time of focus on Scrooge and Belle. I looked forward to those moments as I really felt lucky to work alongside her. Hanna has definitely made an imprint on my heart as this wonderful woman who is passionate about everything she does. She has this bubbly attitude which just helped lighten the world up. Alongside working with Hanna in one one moment, I also got to work alongside Russell Thomas who played a fantastic portrayal of Scrooge. Even though a majority of these times getting to work alongside Russell included other members of the cast in their particular roles, it was nice to take time and see how those scenes ran and how the other members of the cast worked and reacted together with each other. But those special times of working with Russell were nice as I got to see how he was becoming this amazing complex multi-layered character and how he embodied Scrooge into him. Working alongside Russell, I got to see how he worked with his character and how those moments of having a break from rehearsing or between cues I could see the real Russell working, figuring out how Scrooge would do things and how he would implement that onto the stage. When we got round to Tech week the craziness got a little bit more intense as we had longer days and that for quite a few of them we were just sitting around waiting to be called onto the stage for certain things, whether it would be for a scene, a crossover or help with scene changes. It was an amazing feeling to be back on the mainstage under all the lights. Excitement, dread, fear and excess energy flowing through the entire cast as we waited,watching this show that we had been working on for weeks before in tiny chunks come together into a beautiful piece of work we had laboured and poured our hearts into. At first ,we had little in way of clothing to try and find the characters we would become, then a majority of us had one costume for a certain character and we just rolled with that one costume as that was all we had. But we got through it. By the time we had all of our costume pieces, we had a short timeframe to see what our characters would become before the show, but it was enough as both ourselves and our characters became one as we had been working on them for a few weeks already. When it came the run of the show I had been getting home around 11 pm every night in tech week and during the show to get up the next morning at 4:30 am for work. Yes it was strenuous and tiring but the energy of being in the show helped me pull through. In all it didn't really bother me as I felt at home with being on the stage and with a cast I love to call a family. When the time came for Jacqueline to leave us on opening night of the show we had all chipped in for a present to remind her of her amazing experience of being in Fort McMurray and directing a diverse cast of amazing people, it was a shame to see her leave but it was also amazing to see her reaction to the gift that we all lovingly got for her, a painting of the northern lights over downtown Fort McMurray. She broke down in tears of happiness and it felt like that she knew she was loved and respected. She was able to leave a show she lovingly created and molded in the capable hands of the cast and crew. During the run of the eight shows some were thinking about the daunting thought that the show would be over so soon. Yes, that thought is a shame especially when you have lovingly been working on it for five weeks before. For me, it didn't phase me at all as I have done shows in the past so it didn't really affect me at all. When it came to the final run of the show and we all had laboured hard on seven shows before, laughing and becoming closer with everyone, I was mellow and went through the entire run like it was the first time doing it. The only time I felt sad about not continuing with the show was when I had finished my final scene of the breakup between Belle and Scrooge and the end of Act One. I went back into my dressing room and getting out of my costume for Scrooge my thoughts were that: "I'm sad I won't be able to experience this character again". I had put all my hard effort into him and I became him and lived through him, but I knew that it had to end and I was happy about it. I remember being on stage doing the last scene of Act One where Belle breaks up with Scrooge, Hanna says her line "But I'm the same, older, but the same." I had a flashback to when Hanna and I were practicing it in the rehearsal hall. It made me happy to see our hard work become this amazing scene that Hanna and I both poured our hearts into. When we started the top of our final run of Act Two I was happy that I had this experience of doing the show and I knew that we would be done soon but I wasn't going to let that affect me at all and hit the second act as hard as I could because I knew that I had the crazy sweaty task of playing the Ghost of Christmas Future one last time. I know that I said the Ghost of Christmas Future was simple of sorts to get into, in reality becoming the Ghost became a multi-layered ordeal every time. But it was a laugh getting the help of Melissa our wardrobe wizard to help get me into the four or five layered Ghost, going from neon pink and green American football shoulder pads, to adding a thick woollen tunic of sorts, and a hood and some extra drapery with the addition of latex halloween gloves and a foam head stuck to a baseball helmet with a thin black fabric draped in front to cover my actual face. During the few scenes I played as the Ghost of Christmas Future I would be focusing on listening as I couldn't really see due to only being able to stare forward and my poor peripheral vision. I would feel drops of sweat trickling down my back and face. I would come off stage and be happy to get out of costume quickly into my street person costume for the next crossover/scene change I was in. On the final run I was happy to get out of the Ghost of Christmas Future costume but I wasn't as saddened by it. I don't know why. Perhaps because I probably felt more attached to Scrooge than the Ghost or because I wouldn't have to sweat like crazy ever again in that costume, either way, I'm happy to have played him. After the final run of the show we all went back to our dressing rooms and some of us hugged each other in happiness that we had accomplished this amazing feat. Others just went back to get ready to leave and probably reflect on their own. By the time I had changed back into my normal clothes and took my makeup off and cleared my dressing room station away I was one of the last to leave and make my way to the closing show cast party. I was happy that it was over and done with and happy that I got to make some amazing memories with the people I got to call both cast members and family. Whilst I was clearing up my dressing room station, I cleared up my little momentos from cast mates and Jacqueline, I felt happy to have gotten to know this cast and that it has certainly made merealize for sure that theatre and community theatre is one big family which makes memories to keep and cherish for years to come. As I close this thought and call back to this amazing experience of doing and becoming a part of A Christmas Carol, I know for sure I could not have done this without the help of my family and friends, both new and old, and the amazing cast who stood, not just by me, but everyone involved. Thank you all for making this an amazing journey and experience that I will certainly enjoy for years to come. As the last play date has arrived, I want to thank the cast and crew for this exciting experience. The entire process and even reminders was a great learning opportunity. This new “family” has made this year a wonderfully fun time. I hope to see many of you again. I would like to dedicate my final first production performance to my dad in heaven, may my voice have carried up to you with laughter and song.